I am looking for brutal applied art critique. My students are going to be animators so an animation or game art industry brutal critique would be fantastic. In my own class I use the standard Feldman 4-part critique outline and usually leave out the evaluation part until later in the term so students can get used to the other 3 parts: close observation, analysis, and interpretation. Strangely enough I've found several places that SELL brutal critiques and a number of students who request them. I think I will offer an out of class brutal critique option as extra credit for students who want one - inside or outside of class is the question. My students can be their own worst critic so my job is to build confidence and skills so that LATER they can withstand a brutal critique and reply with professional design knowledge and the ability to learn and adapt quickly. I think brutal critiques can range from helpful, to political, to power mongering, and like Brian Sewell as a professional critic one just MUST show one's expertise to the max. There are probably many more reasons to give a brutal critique. If you happen across other places to find brutal critiques please contact me at honoriastarbuck.com. Instone, Ayd. "Getting over Brutal Criticism – You Won’t Have It as Bad as John Lennon." Web log post. Ding. N.p., 28 May 2012. Web. 11 May 2013. http://aydinstone.wordpress.com/2012/05/28/getting-over-brutal-criticism/. Good idea: Find examples from the past that you really like and use them as a benchmark from which to judge your piece! Jordan, Courtney. "It's High Time for Some Brutal Honesty." Web log post. Artist Daily. Http://www.artistdaily.com, 14 Oct. 2012. Web. 11 May 2013. Rojos, Laurie. "PBS MediaShift | 5Across June, 2010 | Arts Criticism in the Digital Age | PBS." PBS MediaShift | 5Across June, 2010 | Arts Criticism in the Digital Age | PBS. PBS. N.d. YouTube. YouTube, 29 June 2010. Web. 11 May 2013. .
Rohrer, Ken. 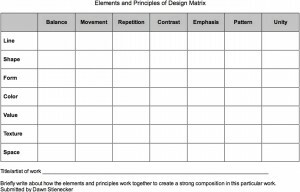 Elements and Principles Matrix. Digital image. Incredible @rt Department. N.p., 2012. Web. 11 May 2013. <http://www.incredibleart.org/files/matrix.htm>.